Shy Virgil, age eleven, is having trouble learning his multiplication tables, so he goes to the resource room at his school every Thursday. Every week, he sees Valencia, a fellow student who is deaf and wears hearing aids. He is interested in getting to know Valencia better, but he's not sure how to approach her. He decides to enlist his friend Kaori Tanaka, who claims to be a psychic, to help him figure out what to do. Before he can fully take advantage of her services, however, a bully attacks him, and he and his guinea pig, Gulliver, end up trapped in a well. Now Virgil is convinced that not only will he never speak to Valencia, but he might never even be found. 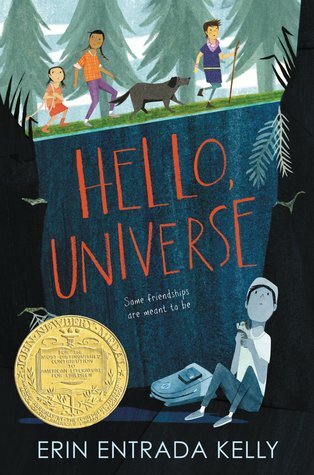 After being let down by the 2019 Newbery winner, Merci Suarez Changes Gears, I became curious about the 2018 medal winner. Sadly, Hello, Universe seems to suffer from the same strains of mediocrity that made Merci Suarez Changes Gears such a disappointment. As I read, I imagined a diversity checklist, and with the introduction of each new character, I checked another box. It feels as though the author tried to ensure that her book would be as inclusive as possible by including as much diversity as possible, whether it contributed to the story or not. Because there are so many main characters, none of them are as well-developed as they could be, and they all feel like token representations of their minority groups rather than three-dimensional characters. These characters are also presented as victims - of clueless parents, unbelievably stereotypical bullies, and general misunderstanding about their identities. The portrayal of bullies is especially bothersome, as both Virgil's bully, Chet, and Valencia's former best friend, Roberta sound like stock characters from a 1990s teen drama. Chet uses the words "retardo" and "pansy" which I don't think I've ever heard in real life. Every bully I've ever encountered has had subtler material. This book also perpetuates the stereotype that kids like Chet get their attitudes from their fathers. The story needs a villain, but Chet and his dad are both too cartoonish to feel like real threats. Roberta and the group of girls who ask Valencia not to hang out with them anymore are also not believable tormentors; their dialogue sounds like it was lifted from an after-school special. Any kid who has been bullied will recognize that this book does not understand how it feels. Additionally, this book presents some problematic religious practices that would prevent me from recommending it to a Catholic family. Kaori relies on crystals and horoscopes to supposedly predict the future. Virgil talks to a mythical character when he is trapped in the well who talks about writing letters to the universe. Valencia prays to a saint, not for intercession, but seemingly as a form of worship. In that sense the book shares the same relativistic point of view as the 2017 Newbery Honor book, The Inquisitor's Tale, but at least it doesn't pretend to do anything else. Each time I read a recent Newbery book, either a medal winner or an honor book, I become more convinced that this award can no longer be trusted to recognize books for their literary merit. This book is not distinctive, nor do I see what it might contribute to the canon of children's literature over a period of more than five years. All it does well is that it includes diversity, and that's a quality that serves a political agenda, not a literary one. From the start, the book feels laden down by all the pandering it does to the so-called "diversity Jedi," and even at its best moments, it still feels like it's trying too hard. Valencia is the strongest character, and I think telling just her story would have made for a better and more cohesive novel. The attempt to be all things to everyone really impacts the overall quality of the story in a negative way. Hello, Universe is eminently forgettable. Newbery winner or not, no one is missing anything by not reading this book. If you're looking for a book about the interconnectedness of different people, and the uncanny ways in which important friendships sometimes form, Criss Cross by Lynne Rae Perkins, the 2006 Newbery Medal winner, is a much better choice. Goodbye, Stranger by Rebecca Stead (2015) is another good alternative. And if you really want to read about what it's like to be trapped in a well, there's a better book for that too: The Girl in the Well is Me by Karen Rivers, published in 2016. I agree 100 % with you. I actually like Kelly's writing but this was not the best of her works. You Go First is much better in my opinion. On a different note, have you read The Book of Boy, the Newbery honor book, yet? I'm interested in what you would think since it reminds me a lot of The Inquisitor's Tale, in that it takes place during the "Dark Ages" and this kid helps a Pilgrim with a quest. He turns out to be someone special (not spoiling it!). Thanks for your work.